How to play the new Rise of Shadows version of Control Shaman this month. 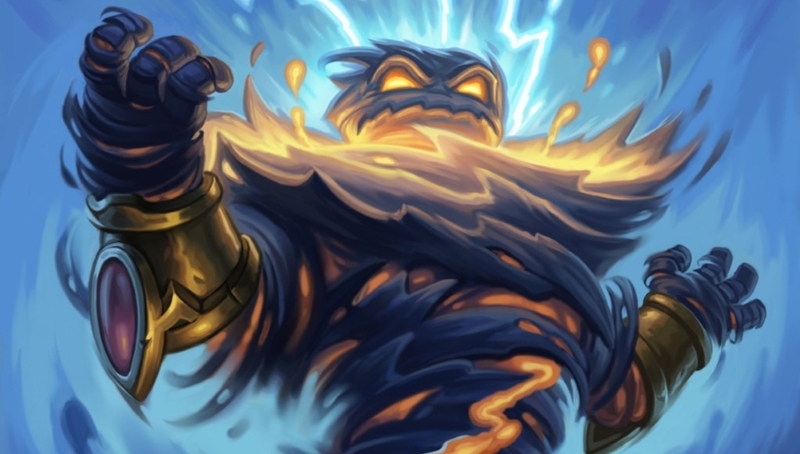 Our Control Shaman deck list guide features the best Rise of Shadows deck list for Hearthstone (April 2019). Our Control Shaman guide also contains Mulligan advice, card combos and strategy tips. Control Shaman is a Hearthstone deck that has hardly ever been considered in the top tier throughout the history of the game. It does, however, have a number of strengths that make it a viable play depending on the other popular decks in the meta. It does particularly well against aggro, for example, which is usually what many players run during the early weeks of a new expansion release. With that in mind, we’re returning to our Control Shaman guide now that Rise of Shadows has been released. We’re dusting it off a little and updating it with a freshly created deck – one that has already taken some pros to the highest-heights of the ranked ladder. If getting the upper hand over aggro sounds like the sort of thing you want to get involved in, then you can find one of the best Control Shaman decks in our guide. Further on, you’ll also find some general strategy advice, Mulligan tips and some insight into the important cards and combos that make this deck work. Here is the strongest version of Control Shaman currently being played on the ranked ladder. It was devised by Dog and while it took him to Legend rank on the Rise of Shadows launch day, he’s suggested there is still room for refinement. As you've no doubt already guessed from the name alone, the objective with this deck is to hold back the opponent's development of the board while simultaneously empowering your own mid to late-game threats. You have so many removal tools across all phases of the game in the form of Lightning Storm, Hex, Hagatha’s Scheme and so on, that can all stop your opponent from establishing a board. Eventually you can turn the corner in the game and start slamming some huge threats onto the board. Your poor opponent, starved of resources by this point, is left with no choice but to concede or watch as you smash away their life total. Early game: Your sole focus is on control in this phase of the game. Handily, you have a wide variety of options for dealing with anything your opponent does to try and establish a board. You can obliterate their minions with spells, bash them away with Likkim and even wipe out wide boards using Lightning Storm. Whatever the case, simply react to what your opponent does with the best cards you have in order to negate all of their actions. Mid game: Continue with your heavy control approach, picking off whatever your opponent decides to play with more of your spells and removal. You can combine some of these with Thunderhead if they have Overload to summon some extra Sparks with Rush in order to make even better trades with your opponent. Also, if Hagatha’s Scheme has been in your hand for some time, then it might have reached such a significant power level that it can work as a full board clear. If you’re running thin on resources in your hand, now is a good time for Spirit of the Frog to draw through some of the spells in your deck and thin it out if you need you late game minions. Witch’s Brew is also on hand if you’ve been hurt a lot and need some healing. Late game: At this point you should be ready to fully switch up your approach from control to aggression. The deck currently lacks an obvious win condition, but big minions such as Swampqueen Hagatha and Walking Fountain are the most imposing threats and will require an immediate response from your opponent - if left unchecked, they can easily win you the game. Archivist Elysiana also offers a potentially interesting path to victory if you can Discover the right group of cards through it. If you get yourself more minions or more direct damage spells you can hope to finish off your opponent that way too! 1. Try to keep their board clear at all times. With all the removal options available to you that shouldn’t be too tough! 2. Encourage your opponent to be greedy and let them play extra minions if you have a board clear ready to go in a turn or two. 3. Likkim offers some excellent value and you should happily trade off a few Health points in order to defeat a minion or two. 4. If you are hit pretty hard in the early game, remember you do have some healing in Witch’s Brew to top you back up. 5. Hex is usually best saved against large late game minions, though you can consider casting it early if you need to remove a bothersome minion earlier. 1. Expect a slower paced start as you both build up to your more powerful late games. 2. Save Hex for their powerful late game cards, as it’s the only hard removal you have in the deck. 3. Many control decks love to run weapons, so hold on to your Acidic Swamp Ooze until they’ve got one equipped to really disrupt their game plan. 4. Similar to Hex, you can also remove an annoying minion from the game with Earth Shock with the added bonus of applying a Silence effect too. 5. When playing Archivist Elysiana, ensure you focus on discovering more late game cards as you’ll need the extra reach when playing against control. Our Mulligan advice will be further expanded once we have a clearer idea of how the deck fares in the live game. For now, we would generally advise you to hold onto your low cost minions and spells in your opening hand. If against aggro, you may want to keep Lightning Storm or Hagatha’s Scheme in order to give you a board clear. As for control, a Hex could come in very handy! - Consider the impact of your spell damage totem in combination with Lightning Storm in particular. Anything you can do to boost the strength of that AOE spell is well worth attempting. - A number of your minions and spells with Overload your Mana for the next turn. Keep this in mind so you don’t mess up your maths on the following turn. It’s also important to consider as while Overloaded your Likkim becomes empowered with a bonus two Attack. - You can use Electra Stormsurge to get even more value out of your big area of effect spells. Having Lightning Storm or Hagatha’s Scheme played twice can usually fully clear the board. - Spirit of the Frog is a big draw engine similar to Gadgetzan Auctioneer. It will draw you a spell from your deck that costs one more than the previous spell you’ve played, so you can start a chain beginning with Zap!, then Lightning Bolt, then Haunting Visions, and so on. - Archivist Elysiana can really help out your late game if you’re stuck for something to play. Getting two copies of five specific cards in your deck can be a huge help, just remember that they replace whatever remains in your deck. Lightning Bolt: Solid removal that can also be used a direct damage should you be missing the final burst to finish off your opponent. Likkim: Incredibly valuable weapon that can beat up most minions at or sometimes even above its own cost if you have Overloaded Mana crystals. Witch’s Brew: You’ll need some healing to survive into the late game and this is a solid option. It helps that it’s repeatable too! Electra Stormsurge: Can provide some extra value from your spells by casting them a second time. Pairs well with your area of effect spells and healing. Haunting Visions: Allows you to find a spell that you may be lacking to make a big play, or offer a nice discount on whichever spell you choose to cast next. Spirit of the Frog: Excellent draw engine for Control Shaman. It can help you get through your deck very quickly to find answers or thin it out to reach your other cards sooner. Thunderhead: With the Overload cards in the deck, this minion can give you some extra damage to help with difficult trades. Swampqueen Hagatha: A strong and unique late game threat and the Horror it grants you can have a big impact on the board. Archivist Elysiana: An interesting way to refine your deck for the late game and set up the exact cards you think you’ll need to win. Hagatha the Witch: Offers big area of effect damage when it enters play and a excellent new hero power that can fill your hand with more Shaman spells. Walking Fountain: An unpretentious, big, beefy minion that you’ll want to play in the late game to start damaging your opponent’s life total. Also excellent at trading and giving you some Health back.